Residential Recycling & Refuse of Texas, Inc. (RRRTx) is the garbage and recycling provider for Spring Creek Forest PUD. Each residence is provided with one container for recyclables. These recycling carts are the property of RRRTx and will be maintained by RRRTx. If you have a trash issue, call (346) 248-5222 to report the issue. 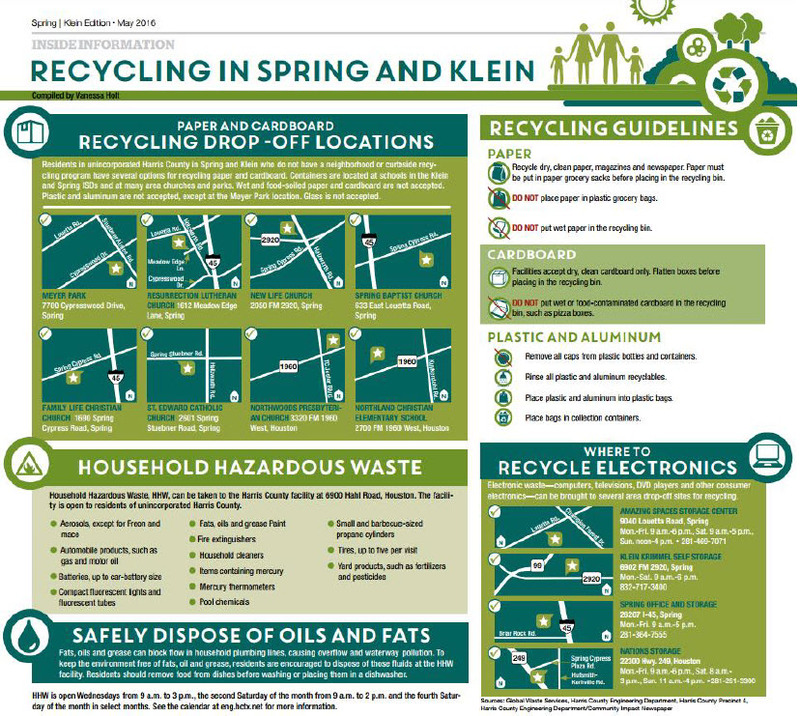 Click here to view the garbage and trash pickup guidelines. Your residential collection day will be Tuesday and Friday each week. Trash must be placed at the curb, or near the garage door (visible from the street), by 7:00 a.m. No trash shall be placed at curb for collection except on the designated trash days. Up to six (6) cans/bags of properly contained household waste, each weighing less than 40 pounds will be accepted for weekly pickup. RRRTx will collect heavy trash including furniture, mattresses, appliances, yard waste, bulky items, and tree trimmings each Friday with your regular garbage. Bagged yard waste will be picked up. Tree trimmings must be less than 3” in diameter, cut into 4-foot lengths and tied neatly in bundles not to exceed 40 pounds. There is a limit of one bulk item per household per day. Yard waste, and bulk items must be placed curbside for collection. Bulk items which are too large for RRRTx to put in with the normal weekly pickup may be collected separately upon request. The Party requesting service will be billed separately at a negotiated price depending on size, quantity and handling required to remove and dispose of item(s). It is illegal to transport any hazardous waste in a trash truck and dispose of it in a landfill. RRRTx will NOT collect medical waste, toxic or radioactive waste, any appliance containing Freon, acids, car batteries, dead animals, and chemicals of any kind, car parts, car tires, and construction trash (includes concrete, large quantities of carpeting, fencing, rolls of carpet or any construction type material or debris). Other excluded items include: Large pieces of glass (must be broken down in smaller pieces and placed in a closed box and labeled), large sofas and sleepers over five (5) feet in length, furniture with metal frames and other metal items, and improperly contained animal waste (animal waste must be placed in a sealed bag to be serviced). Excluded Liquid Waste – Toxic or radioactive waste, Freon, paint, acids, petroleum products or filters are not accepted, cooking oil, or chemicals of any kind. Any CFC (Freon) item must be properly tagged by a certified technician that all Freon has been properly removed in accordance with the Federal Clean Air Act regulations. If items are not tagged, they will be left at curb. Should a holiday fall on a scheduled collection day, collection will occur on the next scheduled pickup day. Notification of changes in schedules due to a holiday will be posted on Harris County MUD 501’s web page. Holidays observed are: New Year’s Day, Memorial Day, Independence Day, Labor Day, Thanksgiving Day, and Christmas Day. The residential recycling day will be every Tuesday. By 7:00 a.m. the containers should be placed at curbside, or near the garage door (visible from the street). Recycling items should be placed in the 48-gallon cart provided by RRRTx. No sorting of different types of recycling items is required, but RRRTx prefers, although does not require, that recycling items be placed in clear, white, or light blue bags before they are placed in the cart. RRRTx will not collect recycling items that are placed in black bags. Items that are for commercial use do not fall under the household recycling umbrella. ADA NOTICE: For persons with questions or needing help regarding website accessibility, or to request the provided information in alternative formats, please call (832) 463-0231.